A 16-year-old boy has been charged with murdering a teenager who was stabbed to death. 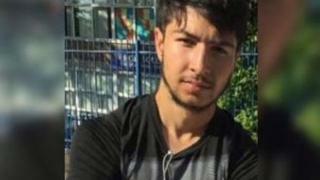 Hazrat Umar, 18, was found fatally injured in Norwood Road in Bordesley Green, Birmingham, at about 14:00 GMT on Monday. He died at the scene. West Midlands Police arrested the boy on Monday night. The teenager, who is from Birmingham and cannot be named for legal reasons, appeared at the city's magistrates' court. He was ordered to appear at Birmingham Crown Court on Monday. The South and City College Birmingham student, who lived in Bordesley Green, was the third teenager to be killed in the city in 12 days after the deaths of Abdullah Muhammad and Sidali Mohamed. Image caption Hazrat Umar's family said he "brought warmth, kindness and love"
In a statement, Mr Umar's family said he was "so very loved". "The emptiness we feel after losing Hazrat can't be described," they added. "Nobody deserves to have their life ended this way. Hazrat brought warmth, kindness and love to all his family and friends. Nothing can take away the pain of his untimely and tragic departure." Mr Afzal added: "I don't want any other family having to experience what our family has." Det Insp Michelle Allen said: "This is a tragic loss of the life of a popular local young man. "I appeal to anyone who has any information and has not yet come forward to contact us at the earliest opportunity." Earlier this week, West Midlands Police Chief Constable Dave Thompson said knife crime was "an emergency" after the three fatal stabbings.